This is going to be shorter than I thought it would be. The “Community & Family Life” and Holodecks sections are on the same page, and it’s followed up by full character profiles so I don’t want to combine them into the same section. And given how full my personal life was this week something short may be of benefit to me. This is the last bit of external world building, unless you count the terminology at the end of the guide. After this we’re looking at the lives of the individual characters. But this section is so short I can probably post the whole thing. Which is good because I can’t even add anything to the introduction, so let’s just dive in and see what life is like aboard a Galaxy-Class Starship. As humanity probes deeper and deeper into space with ten-year or longer missions the norm, Starfleet has begun encouraging crewpersons to share space exploration adventure with their families. Twenty-fourth century humans believe that Life should be lived, not postponed. Considering how many people die during space exploration on the original Star Trek alone (I’d add enemies, but the Klingons are on their side at this point and the Romulans had disappeared for a time) I’m not sure it’s a good idea to bring kids. I wonder how many non-crew passengers were turned into Borg or in a part of the ship that was ripped off. Storywise, it does offer some potential but while one or two stories focused on the children nothing was really done with spouses. Were there some that contributed to the civilian part of the ship? Others who stayed home all day. “My husband/wife isn’t an official crew member but she has some expertise that may be of help to you, sir” never comes up. Did anyone bring their parents? I feel like the civilians were never really utilized on the show. Previous experience in space exploration have underscored the lesson that people need people for mental and physical health. Starfleet encourages its people to participate in family and community life and bonding. That’s great on a colony but while Roddenberry wanted to tone down the “military” aspects the crew did still find themselves in battles. That’s why the saucer section could separate in the first place, but it was done so rarely it seemed a useless feature. I’m not against the idea mind you, but given the situations they often found themselves in there are questions that are never raised. Although non-crew spouses and children are rarely seen in the command and other duty areas of the vessel, the sophistication of starships now includes a variety of single and group family modules, various levels of schools and study facilities, a large section for entertainment, sports and other recreational forms, and contests (electronic and other) of a thousand kinds. As previously noted in this series there doesn’t seem to be a lot of entertainment in the future. We only see classical music concerts (Riker mentions a love of jazz but I can’t remember seeing it or any other music genre not matching a visited time period show up a lot), the only sport I remember is something akin to the “Joust” game from American Gladiators, and the only recreation being the holodeck, where we never see anyone outside of the crew using. I think we saw the school a few times though, but no other single/group family modules. It’s like the same problem the writers had with Wesley. They seem incapable of writing anyone other than actual Starfleet officers. Speaking of the holodeck, the last paragraph on this page is titles “Holodecks Can Simulate Any Environment”. You remember holodecks, right? Those places people go to relax until the safeties get off-lined and it tries to kill everyone inside? 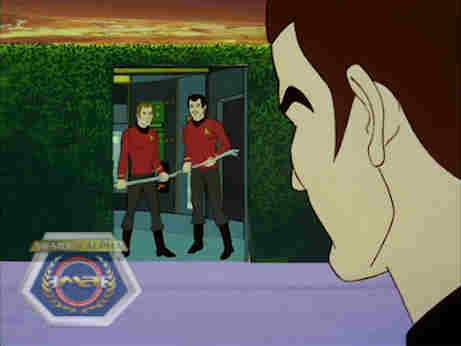 Above is a scene from the Animated Series episode “The Practical Joker”, which featured a “rec room” that acted like a holodeck, right down to nearly killing McCoy, Uhura, and Sulu. That was more of a really large room that lacked the grid pattern you see in the 24th century holodecks. Apparently Roddenberry always wanted to include it in the original series but due to the budget couldn’t. DC Fontana claims the creative staff of TNG didn’t remember the TAS holodeck and whether or not the technology should even exist back then is up for debate, made worse by its appearance in Discovery, a show that can’t decide what continuity it is a part of. The Enterprise‘s holodecks can duplicate with startling reality almost any landscape or seaworld complete with winds, tides, precipitation, and whatever. These decks are much used in both education and recreation and are even more important in preventing crew and families from feeling like they are living “contained and limited lives”. In the holodecks almost any kind of recreation, training, or exercise can be simulated, especially since these same decks can also make potent use of the starship’s gravity control system. This also permits, for example, the challenge of skiing any real or imaginable slope or engaging in exciting mid-air low gravity games or contests. And like the families this is rarely explored. There are times when the holodeck does do more than try to kill the occupants. It’s been used to recreate crime scenes and planetary incidents. Geordi used it once to recreate a lab where the engines were designed in order to solve a problem with them. But we’ve never just seen a story that has the crew doing something fun. I would have loved to seen a full episode where we just followed the crew playing out a Dixon Hill mystery and maybe discussing it during a point away from it for example. It would have been a nice change of pace for the actors and would show what the holodeck is like when it isn’t turning against them or being used for non-recreational purposes. Maybe one of the comics did something like this but it wasn’t done in the show. (I think there was a novel based on Tom Paris’ “Captain Proton” homage to the old serials but that’s the closest we’ve come.) If it is used only for recreational moments it’s either a short character moment or a prologue to the actual story. Again, it feels like a missed opportunity. So this turned out to be less about the story bible versus the show and more my review of how the ball was dropped. Next time we’ll begin our look at the profiles of the various crewmembers in more detail. It should be interesting to see what parts of their personality and backstory made their way into the actual show. Posted by ShadowWing Tronix on October 5, 2018 in Star Trek: The Next Story Bible and tagged holodeck, Star Trek: The Next Generation, story bible, writer's bible.